Yummy Polka Dot Flip Flops Personalized Note Cards. Cards are available in pink, green, blue, purple and yellow! Pink & Green are pictured below. Choose Your Color of your flip flops here! 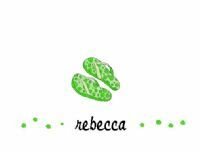 Enter personalization for yummy polka dot flip flops personalized note cards here!